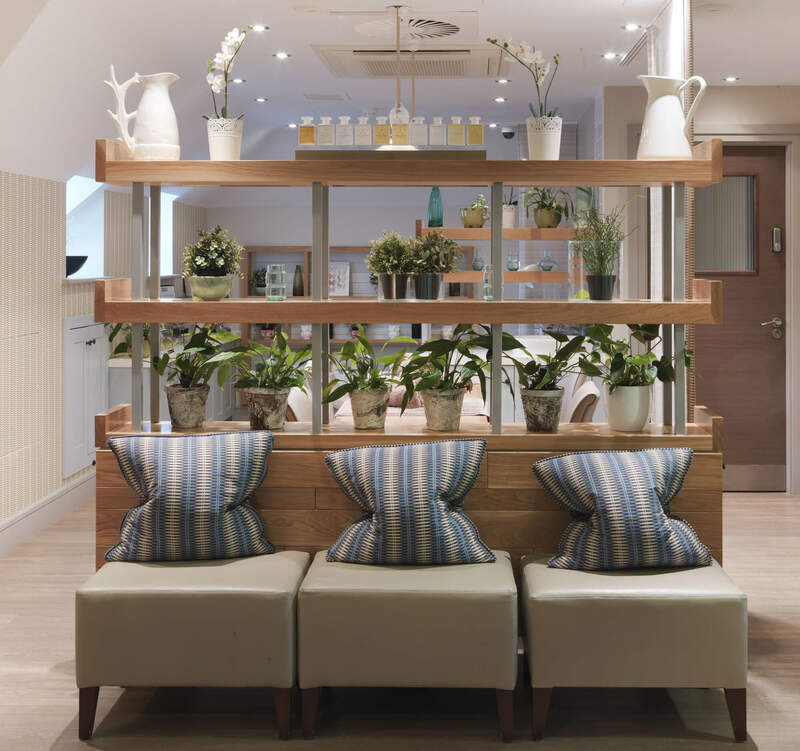 Ever since its opening back in 2004 Calcot spa has been a firm favorite with Spa users, Beauty Editors & Bloggers, and has attracted much press coverage and multiple awards. Conde Nast Traveler recently included it in their ‘15 most wonderful spas in the England’ – which they noted as ‘one of the most consistently excellent in the country’’. Sparcstudio directors were responsible for the original design and have over the years worked closely with the client to evolve the offer with upgrades of the facilities across the sap and including the addition of a new manicure pedicure makeup zone. The essence of the offer however has remained the same. 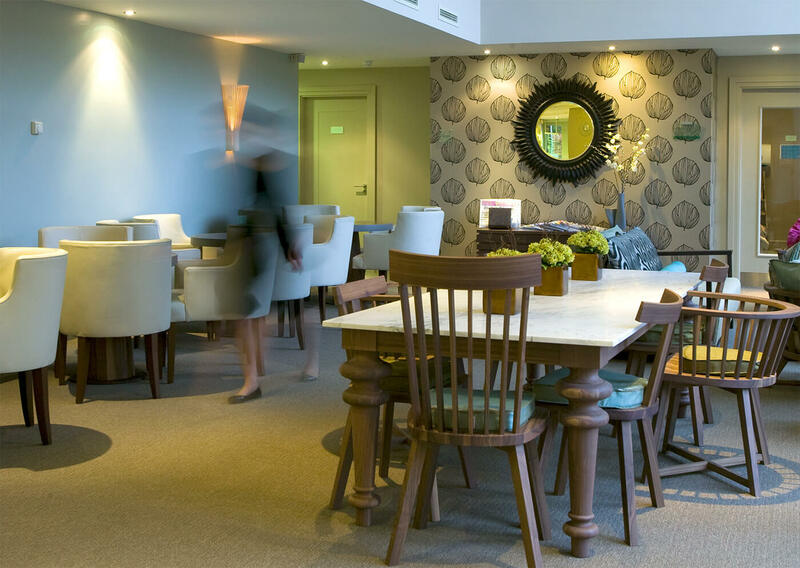 The spa is located a short distance from the hubbub of the main hotel (Calcot hotel has won many accolades for being Family friendly) . Formed from Cotswold stone the spa building was designed as a ‘u shaped’ plan thus forming a wonderful internal courtyard, and also providing natural light throughout the spa interior. The Spa garden within is undoubtedly the ‘jewel in the crown’ of the spa. 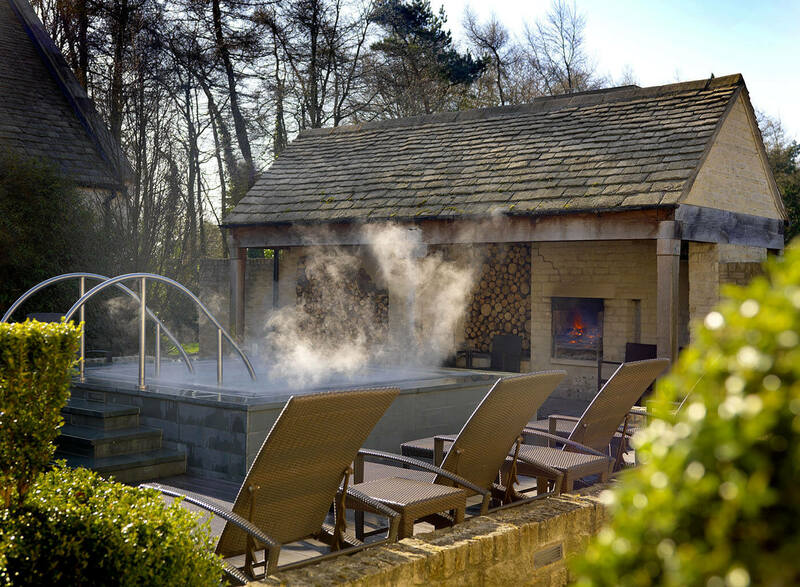 Probably one of the first of its kind in the country at that time, Sparcstudio created a rustic Cotswold stone wood burning fire as a central focal point, in-front of which sits a slate lined bespoke designed spa pool surrounded by lavender fringed relaxation areas. The spa includes a spa lounge/restaurant overlooking the courtyard, with luxurious changing rooms leading onto a large 16M swimming pool. Fitness areas include a gym and studio. 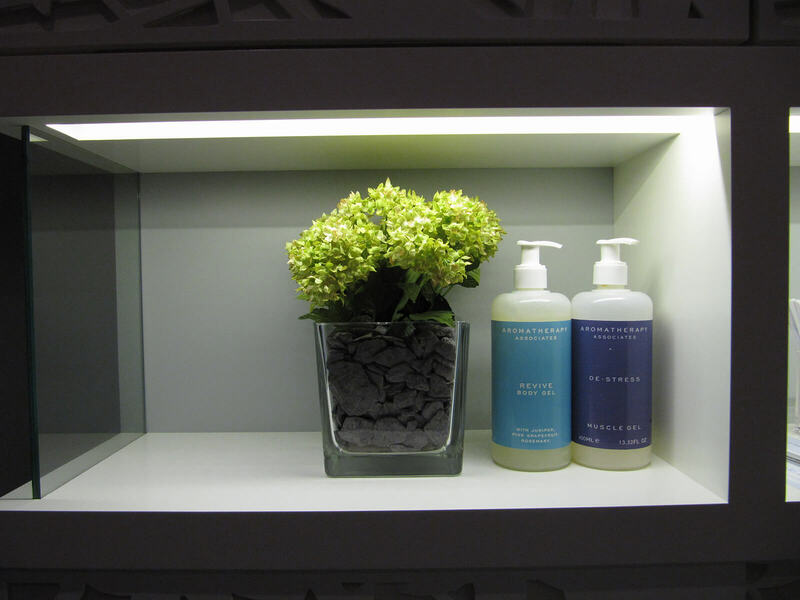 The treatment zones are located in the adult only area on the first floor complete with Manicure, Pedicure and Makeup zone and a thermal suite with relaxation room. There are 7 individually designed treatment rooms. The beautifully designed spa is flooded with natural light and the neutral artwork and furnishings reflect the surrounding countryside. Tucked inside the traditional courtyard garden of Calcot Manor hotel, the Calcot Spa has gained an enviable reputation of its own. 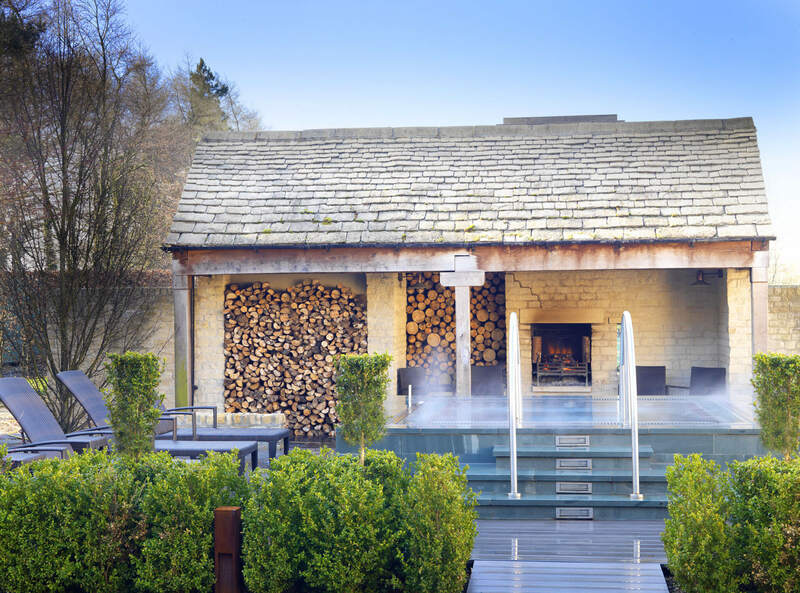 Since opening in 2003, the lengthy list of innovative treatments, along with the outdoor hot-tub complete with blazing log fire, has cemented Calcot Spa as a must-visit beauty destination. The spa’s piece-de-resistance has to be its outdoor courtyard with large hot tub. The tub is backed by an open wood-burning fireplace and bordered with lavender and topiary hedges. It’s pretty special to sit outside in the warm water and smell wood-smoke mixed with lavender.